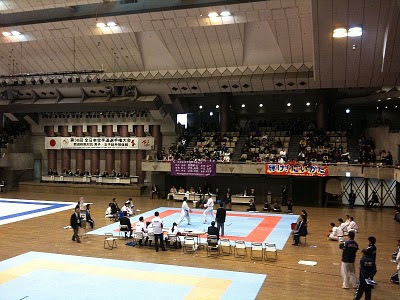 The prefecture team kumite matches were today at the Tokyo Budokan. Men: Kyoto vs Kanagawa, with Kyoto winning 3-1. Okayama vs Osaka, with Okayama winning 3-1. Women; Tokyo vs Kanagawa, with Tokyo winning 2-1. Kyoto vs Osaka, with Kyoto winning 2-1 in overtime. Therefore tomorrow at the Nippon Budokan for the finals it will be for the men Kyoto vs Kanagawa, and for the women Tokyo vs Kyoto. At today's event there were different levels of athletes. But there were no clear announcements or good signage as to how the tournament was progressing. Lots of people went to watch. I ended up finding a seat with a group of elementary school age Goju students from Shizuoka whose several parents had driven them to the event simply to watch and study.